The Paris Feast: A weekend walk traversing unique landmarks in the heart of Paris. A weekend walk traversing unique landmarks in the heart of Paris. I have realized that during my routine weekend walks through Paris, the locations and places that I traverse are quite unique, interesting and of high touristic importance. 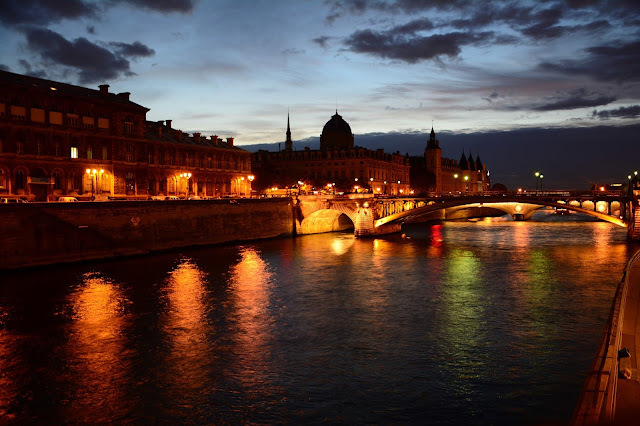 On numerous occasions I have presented these Parisian sights to my visiting friends and family. 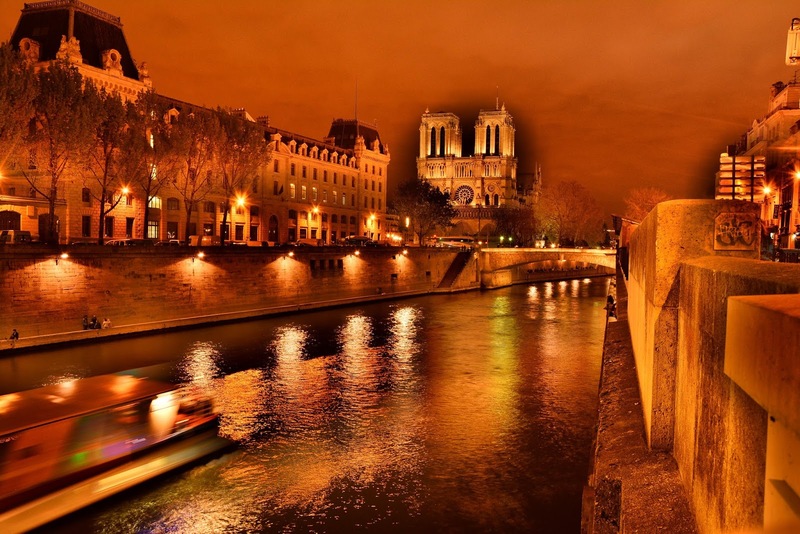 How about just jotting down one such quotidian walks and through Paris, present a few of the numerous enigmatic but fascinating landmarks of Paris. 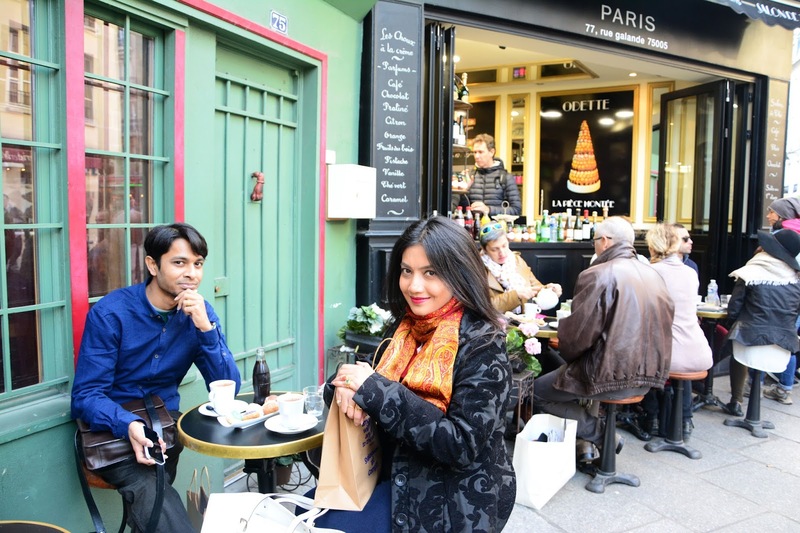 This weekend we went out with Sreyash, who has recently moved to Paris for his masters’ course (he also happens to be the son of one of Mitra's professor from Calcutta University) and we thought of taking him around some of our favorite locations of Paris. 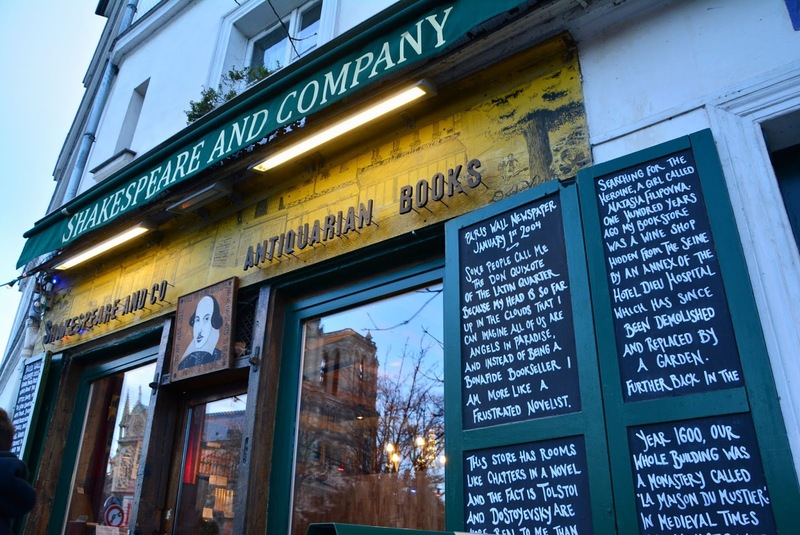 First stop was the bookstore Shakespeare and Company in the 5th Arrondissement, where we decided to meet. Shakespeare and Company is one of the most famous English bookstores of Paris, founded in 1951 by an American, George Whitman at 37 rue de la Bûcherie on the banks of the Seine, opposite the Notre Dame Cathedral. The building which hosts the bookstore was originally a 17th century monastery, La Maison du Mustier. The bookstore owes its name to two different references, first the original name Le Mistral was changed to the present name in 1964 on the 4ooth birth anniversary of Shakespeare. Secondly and more importantly it bears same the name as the famous bookstore of Sylvia Beach that existed in Paris from 1919-1941 about a kilometer away on Rue de l’Odeon and which was a gathering place for the great expat writers of the time including Joyce, Hemingway, Stein, Fitzgerald, Eliot, Pound and others. This weekend it was time again to practice one the activities that gives me pleasure, to buy new books. After going through their present collection I bought four books by four different authors. 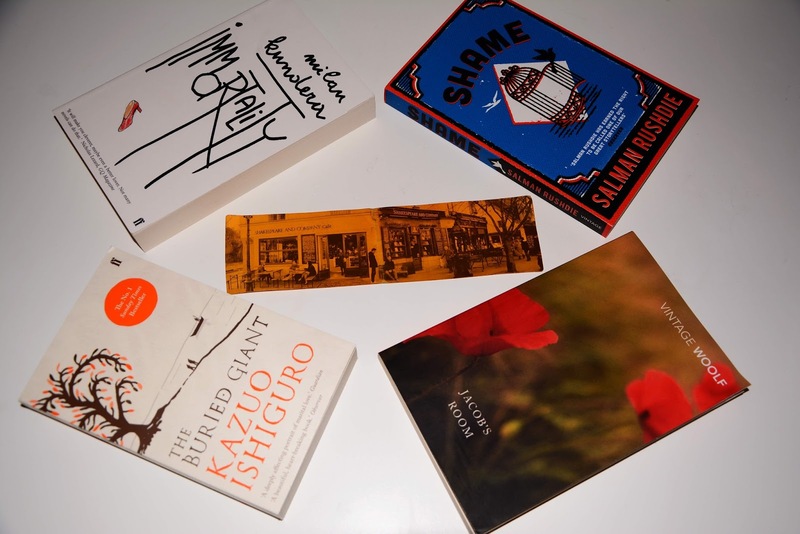 Sreyash opted for two books and a postcard collection. By the time we finished buying the books we were thirsty, so we made our way through the street adjacent to the cafe of the bookstore to Odette Paris. Odette Paris is famous for its Choux à la crème (I have a previous blog post dedicated to it) so while placing the order it is needless to say that we opted for some choux and for drinks Sreyash and I opted for some hot chocolat while Mitra as usual took a bottle of coca cola. 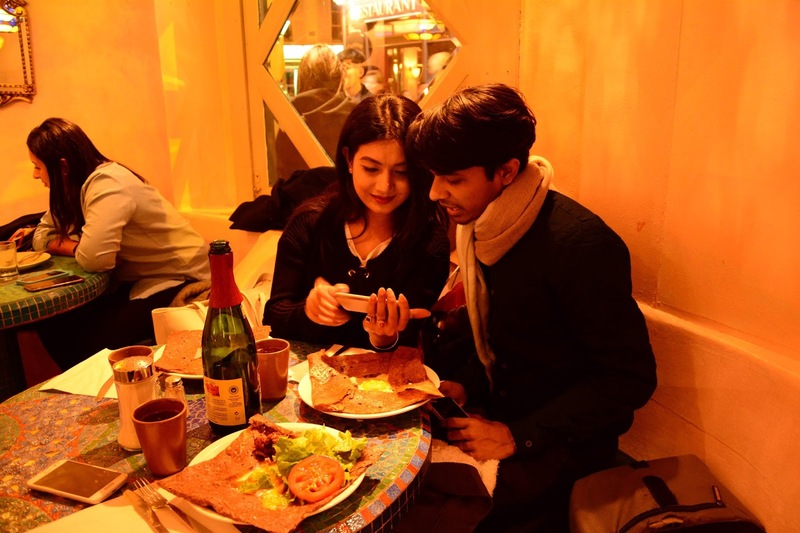 After a little bit of chit-chat, munching up the choux and gulping down the hot chocolat, we left Odette Paris and made our way towards the Notre Dame Cathedral. Yes! This is where in Victor Hugo’ian universe there is supposed to be the hunchbacked bell ringer Quasimodo, where in the real world Napoleon Bonaparte was crowned emperor in 1804 and whose façade with two towers is the second most important icon of Paris after the Eiffel tower. Sreyash was busy clicking pictures of the cathedral and we slowly made our way through the crowd towards Rue d'Arcole. The cathedral is located on Ile de la Cite, one of the two islands on the Seine in central Paris, in the 4th Arrondissement. I showed him the Hospital Hotel Dieu on the left hand side which happens to be the oldest operating hospital in the world, founded in 651A.D. 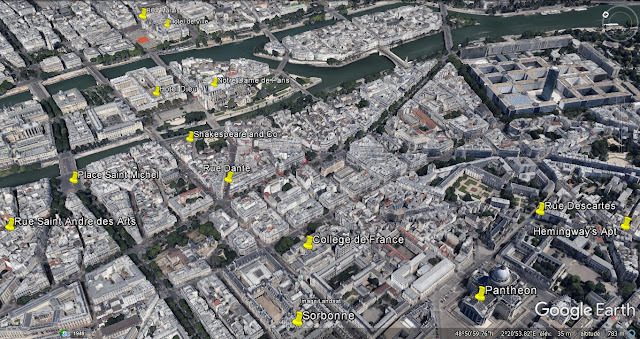 In the present day, apart from the emergency department, a diabetes and endocrine department and a major department of ophthalmology, all other departments have been moved to other centers across Paris. The right side of the street is lined with cafes and souvenir shops. Most of those restaurants and cafes are however tourist traps, so I would advise avoiding trying out the “French authentic gastronomy” there. Then we crossed the Pont d'Arcole and we arrived at the Hotel de Ville, the city hall of Paris. Mitra started to narrate a brief history of Hotel de Ville and why its architecture is different from the adjacent buildings. I will put it down here as well. It all started in the 1850s when Emperor Napoleon III commissioned a complete reconstruction of Paris, directed by the prefect of the Seine, Georges-Eugène Haussmann. The aim was to do away with the crowded and unhealthy medieval neighborhoods with wider avenues and a modern architecture. The Paris we see today including the slate colored roof-tops, the Haussmannian architecture, thus took form then. 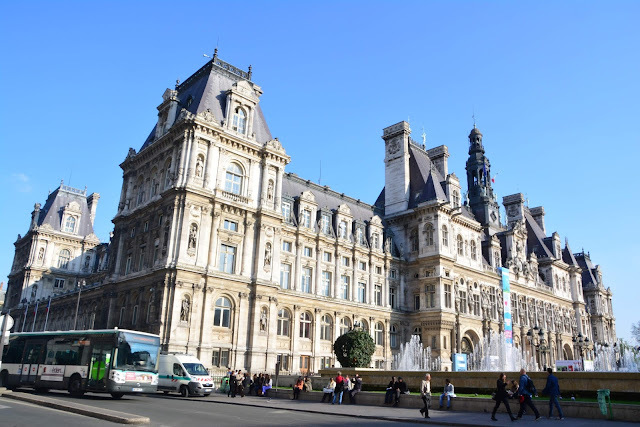 Now why is Hotel de Ville, the most important civic building of Paris not Haussmannian? This is due to one of the many revolutions that this city has lived through. Following the collapse of Napoleon III’s Second Empire, a revolutionary government, the Paris commune (communards) ruled the city from 18 March to 28 May, 1871. When this government was eventually and brutally disarmed by the subsequent Third Republic, the communards burnt down the Hotel de Ville and with it all the documents relating to the revolutionary period. The new Hotel de Ville took 19 years to be reconstructed (1873-1892) and it was done following a copy of the 16th-century French Renaissance style Hotel de Ville and thus Haussmannian touches cannot be traced on it unlike its neighbouring buildings. 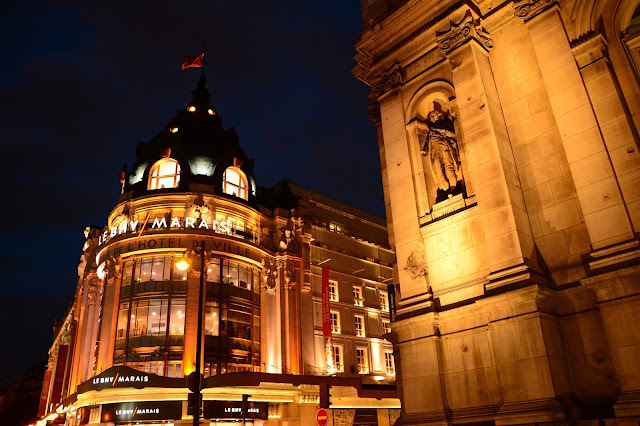 Now it was time to indulge in another of my favorite activities, shopping and one of the best places for it, in central Paris is the BHV Marais, on Rue de Rivoli in the 4th arrondissement, facing the Hôtel de Ville. The Bazar de l'Hôtel de Ville (BHV) was founded by Xavier Ruel in the 1850s when he as a small vendor decided to open a shop to attract the customers from the nearby city hall. The present building was however built in the early 1900s at the same place where Ruel had his bazaar. In 1991, the BHV was bought by the well-known Parisian upmarket departmental store chain, the Galeries Lafayette group. Ok! Let us get to the interesting part, my shopping. 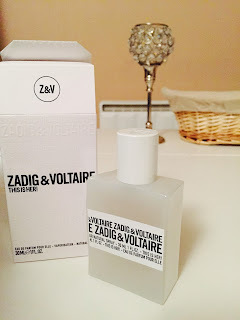 I wanted to buy the newly launched perfume 'This is Her' of the fashion house Zadig et Voltaire. Having read the composition I had a feeling that I would love the smell. But while making my way towards the perfume counter I saw racks adorned with different scarves. I opted for a black, white and grey combination scarf while Mitra opted for dark grey one. Next stop was the perfume counter. I tried 'This is Her' and immediately fell in love with the juxtaposition of jasmine, rose and sweet smelling vanilla bean. As time went by the smell developed and the smell of sandalwood started to make its way. 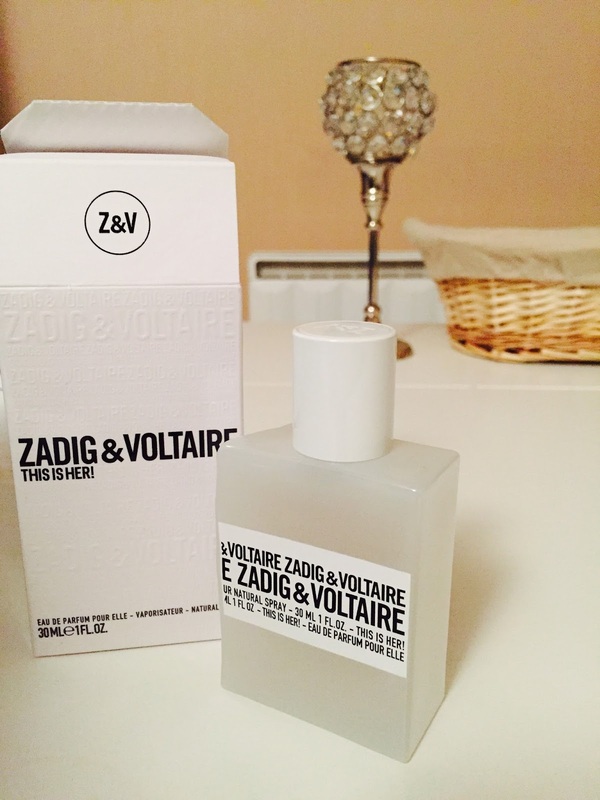 I'm over the moon with this perfume and its needless to say that it is my current favorite. Sreyash asked me to suggest him a perfume. Keeping in mind his liking for something very light, I suggested him to opt for an eau de cologne. 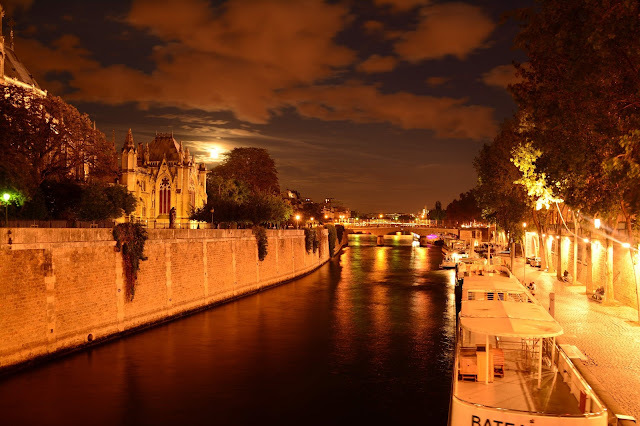 Following the shopping, we headed out, retraced our path, across the Seine, crossing the Ile de la Cite, past the Shakespeare and Company, towards Rue Dante. The array of bookstores on both the sides of the street are dedicated to comics. Ah Yes! I must mention here that it was a full moon night and the view of the illuminated disc over the Seine was magnificent. Ok! Now back to the stroll. Where were we heading to? You, (like Sreyash at that point of time) would soon get to know. After walking for a while we showed him the 'College de France' which is a renowned higher education and research establishment founded in 1530, which does not grant degrees but each professor is required to give lectures where attendance is free and open to anyone. To be selected as a professor of the College de France is an honor and coveted by all academicians in sciences and humanities. Then we walked on, took a right turn and faced directly the Pantheon. It was originally built as a church dedicated to St. Genevieve to celebrate the recovery of King Louis XV from his illness in 1744. Post the French Revolution of 1789, the National Constituent Assembly decided to convert the church into a mausoleum. It is now a burial site “To great men, the grateful homeland" according to the inscription below the magnificent dome. 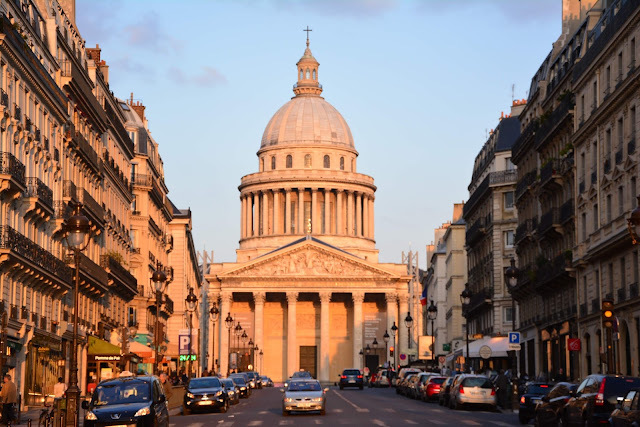 The greats buried at the pantheon include Voltaire, Rousseau, Victor Hugo, Émile Zola, Jean Moulin, Louis Braille, Jean Jaurès, Marie and Pierre Curie, Gambetta and Andre Malraux. It was also from its dome that in 1851, Léon Foucault suspended a 67 meter pendulum to demonstrate the rotation of the earth. A replica of the Foucault’s pendulum can still be seen today hanging from the very dome. Then we walked straight on to Rue Descartes. There's an array of pubs and bars on both sides of the street. 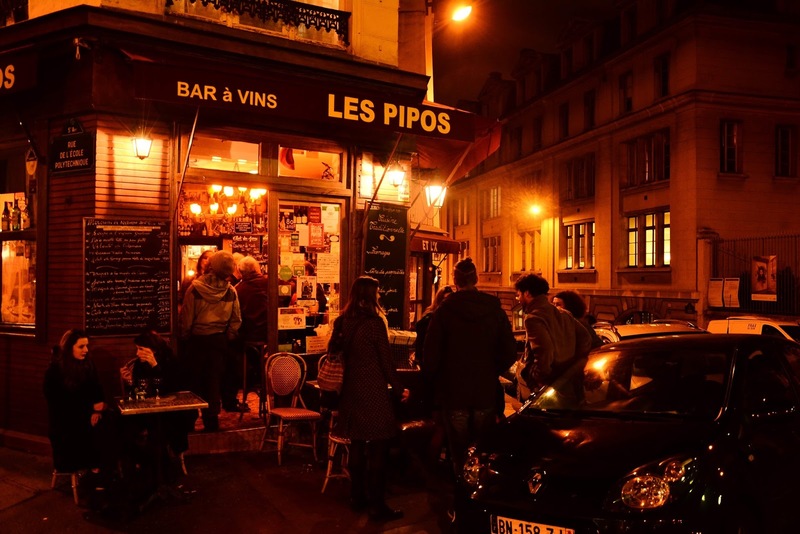 These bars are usually frequented by the students of Latin Quarter and other universities of Paris. As we were pressed for time we were not able to go to any of these bars for a drink that day. We walked on a bit more and we reached the apartment on 74 Rue du Cardinal-Lemoine, our destination. This apartment was mentioned numerous times in the book “A Moveable Feast” (somewhat a namesake of this blog). Yes! This was the house where Ernest Hemmingway lived with his first wife Hadley from 1922-1923 and this was his first apartment in Paris. I believe Sreyash was elated to see this apartment, a secret delight for lovers of literature. Now it was time to wrap up the sightseeing trip of Paris and head out for dinner. We took the metro to Place Saint Michel. I proposed to eat crepes and galettes for dinner. As it was a weekend, getting a place for three in any restaurant or cafe was quite difficult. 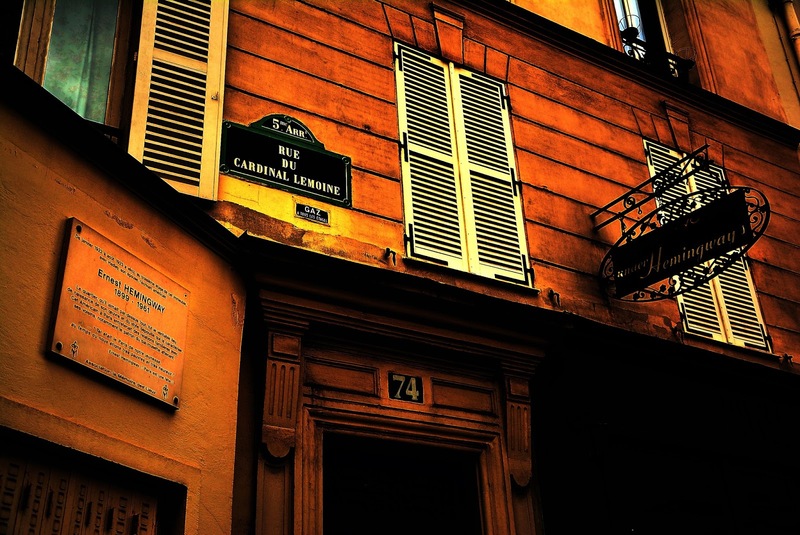 After walking for a while we managed to get a place at the Crêperie St. Germaine on Rue St. Andre des Arts. This street generally is known for its creperies and we can find quite a few lined up along it. However one of the best creperies of Paris is found elsewhere, look at my earlier post on it for details. The crêperie had a bohemian decor with mosaic tables and colorful lamps. For the first course we ordered galettes of our choice and a cidre to drink along with it. We raised a toast to Paris and took the first sip. For desserts we ordered crepes. Sreyash and I were quite full so we preferred to share a crepe while Mitra opted for a whole one. Must say Mitra has got a big appetite. With it the evening came to an end, it was an evening well spent in the company of like-minded people and I am waiting for more such evenings to come.